grow a healthy, organic garden! Simply select the subscription below that best suits your garden size to start your risk-free 30 day trial. Interested in gifting a subscription to someone else? Click here to see our gift options! LARGE GARDEN Personal Subscriptions include 5 Certified Organic, heirloom seed varieties per month. Best for a few raised beds to large sized gardens over 100 square feet. SMALL GARDEN Personal Subscriptions include 3 Certified Organic, heirloom seed varieties per month. Best for patios, balconies, and gardens less than 100 square feet. Click here to view Canadian Membership options. 1. Offer valid for a limited time & for US customers only. 2. To register for your free 30 day trial, a valid credit or debit card is required. 3. You will be charged a one-time $3.99 processing + delivery fee when you place your order. After the free trial period (30 days) ends, you will begin to get charged for the subscription you selected above. 4. You can cancel at any time. 5. Existing customers are not eligible. 6. After your free trial, you will automatically continue getting monthly seed deliveries + access to GrowJourney services unless you cancel online (which you can easily do at any time). 7. This offer may not be redeemed in conjunction with any other offer and is limited to one per household. 8. Terms and conditions apply. Visit www.growjourney.com/terms-of-service/ for further details. Surprise! Each month, your gift recipient will receive 3 or 5 unique packets (depending on the plan you choose above) of seasonally-selected, certified organic, heirloom gardening seeds guaranteed to grow in their climate zone. Plus, they’ll get exclusive access to our suite of expert online growing instructions that make organic gardening simple. Our Large Garden Subscriptions include 5 seed varieties per month. This is the ideal subscription if you have a garden OVER 100 Sq. Ft. (a few raised beds) of space all the way up to a fully edible landscape. Some seed varieties in this subscription will need room to grow. 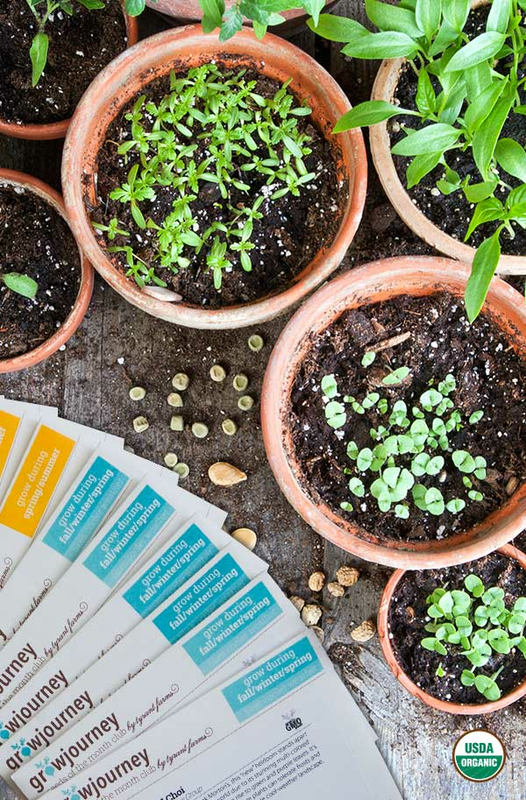 Our Small Garden Subscriptions include 3 seed varieties per month. This is the ideal subscription if you have a garden UNDER 100 Sq. Ft. (a couple of raised beds) of space all the way down to a few pots on a patio. All seed varieties in this subscription are perfect for small spaces. Are your seeds certified organic? Yes! All of our seeds are USDA Certified Organic. Not only are you supporting certified organic seed farmers, you’ll be getting seeds that will grow better in your own organic garden. Can I save my GrowJourney seeds from year to year? Yes! Nothing makes us happier than people saving seeds from the plants they grow themselves. Well one thing makes us happier: you sharing the seeds you saved yourself. That’s why we teach you how to save your seeds in our members-only GrowGuides. Do you sell GMO seeds? None of our seeds are genetically modified. At this point, genetically modified seeds are only sold and used in the commercial agricultural sector, not the home gardening sector; additionally, certified organic seeds can not be genetically modified. Even if they were available to gardeners, GrowJourney would only offer certified organic, open-pollinated, heirloom garden seeds. Each month, you will receive unique packets of carefully selected, certified organic, heirloom gardening seeds guaranteed to grow in your climate zone. Plus, you’ll get exclusive access to our expert online growing instructions that teach you how to grow a healthy, organic garden all the way from seed to harvest. What types of seed will I receive? Every month is different, but you can expect to get a mix of seasonally-selected fruit, veggie, herb, and edible flower seeds. Sometimes, we also include seeds intended to attract and feed beneficial pollinators, such as bees and butterflies.